I was preparing tonight's dinner of meatloaf, (sorta-homemade mac & cheese, corn on the cob). Standing over the sink, shucking the corn, I remember my childhood summers shucking wheelbarrows full of Dad's sweet corn, freshly picked. What brought it back was the flash of anxiety as I prepared to pull down the husks of the first grocery-store-bought ear . . . "What if there is a worm?" I thought to myself. As a kid, I hated encountering the worms in the tips of occasional ears of corn, tiny little wriggles that had bored into the small, sweet kernels, to the fructose inside. The ate little tunnels on the ears and turned the affected areas of cob into mush that got on your fingers and made you think of death, corruptability, the impermanence of things . . . you know . . . I found no worms in tonight's corn. But I did find myself reminiscensing about those childhood days. 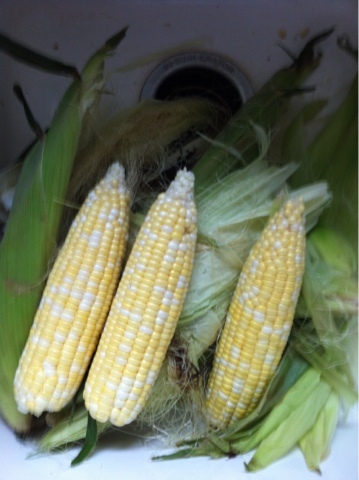 I disliked sitting in the humid summer mornings, shucking (what seemed to be) hundreds of ears of corn, getting my fingers sticky with the sugary sap that oozed out of busted kernels. Using a bristle brush to tease out the silks. Again and again and again. It seemed tedious, and hot, and something I'd rather not be doing when I wanted to watch TV inside with the air conditioner on. Now, I'd really enjoy sitting down with mom and my sister to whittle down a barrow full of corn. It would be full, familial, and familiar.